Movement of air is known as wind. It can flow from any direction from horizontal to vertical depending on the energy balance. Wind can also curve or even rotate. Examples of rotating air are tornadoes and dust devils. Wind speed and direction is measured by anemometers which vary in accuracy. The units of measurement for wind speed is normally km/hr (kilometres per hour). Direction of wind is determined as a bearing angle from N. It is sufficient to use the eight points of the compass as a basis for determination of wind direction. Wind direction is noted from where it approaches, not where it is heading. There are many different types of instruments that measure wind speed and direction. However, the most common instrument used is known as an anemometer. It consists of three cups on arms that can rotate measuring wind speeds based on rate of rotations and a vane which indicates the wind direction. 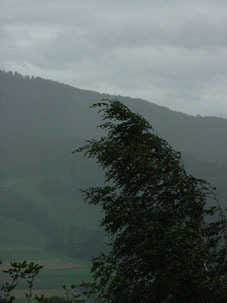 Trees are an efficient form of estimating wind strength. Flexible trees such as the weeping willow is good for lighter wind conditions whilst trees with stronger, less flexible branches sway during moderate to strong winds. 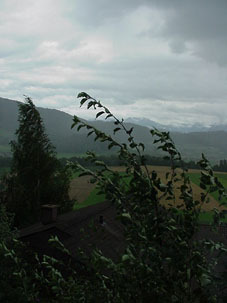 Once wind reaches the strong to gale force category, damage to trees begin to occur such as broken twigs, branches and removal of leaves. The Beaufort scale incorporates these measurement techniques and other effects into certain ranges of wind strength estimates. Wind can also create sound. Wind passing around an object causes vibrations of that object that in turn creates a sound, normally a hissing or howling sound. We tend to perceive wind strengths based on certain sounds but mainly because we have really associated these sounds with the wind effects on objects. The movement of fast moving low clouds normally indicates the approximate direction of the wind. Fog also will move in the direction of the wind. Wind can raise dust and other light objects and therefore following, this movement is yet another technique that can help you estimate the strength and direction of the wind. It also can reveal eddies created by objects as wind flows around them. The same technique applies for blowing snow but this normally requires higher wind speeds. If you are near or on a lake or ocean, it is possible to observe surface flow of wind based on the changes in water texture or ripples. Relatively stronger winds will disturb the water surface causing ripples. This region of ripples or darker texture can be observed moving as the wind progresses. Therefore, if this region passes over your location, you will experience stronger winds. This technique is widely used by sailors. Wind can also create waves with heights that vary according to the wind speed. There are probably other techniques not discussed here that can be used to observe wind. However, what has been discussed indicates various approaches that directly relate to more immediate wind effects. One of the first scales to estimate wind speeds and the effects was created by Britain's Admiral Sir Francis Beaufort (1774-1857). He developed the scale in 1805 to help sailors estimate the winds via visual observations. The scale starts with 0 and goes to a force of 12. The Beaufort scale is still used today to estimate wind strengths. 0 00-01 00-01 Calm Calm; smoke rises verticall. 1 01-03 01-03 Light air Direction of wind shown by smoke drift, but not by wind vanes. 2 04-07 04-06 Light Breeze Wind felt on face; leaves rustle; ordinary vanes moved by wind. 3 08-12 07-10 Gentle Breeze Leaves and small twigs in constant motion; wind extends light flag. 5 19-24 17-21 Fresh Breeze Small trees in leaf begin to sway; crested wavelets form on inland waters. BEAUFORT SCALE: Specifications and equivalent speeds for use at sea. 0 00-01 00-01 Calm Sea like a mirror. 1 01-03 01-03 Light air Ripples with the appearance of scales are formed, but without foam crests. 2 04-07 04-06 Light Breeze Small wavelets, still short, but more pronounced. Crests have a glassy appearance and do not break. 3 08-12 07-10 Gentle Breeze Large wavelets. Crests begin to break. Foam of glassy appearance. Perhaps scattered white horses. 4 13-18 11-16 Moderate Breeze Small waves, becoming larger; fairly frequent white horses. 5 19-24 17-21 Fresh Breeze Moderate waves, taking a more pronounced long form; many white horses are formed. Chance of some spray. 6 25-31 22-27 Strong Breeze Large waves begin to form; the white foam crests are more extensive everywhere. Probably some spray. 7 32-38 28-33 Near Gale Sea heaps up and white foam from breaking waves begins to be blown in streaks along the direction of the wind. 8 39-46 34-40 Gale Moderately high waves of greater length; edges of crests begin to breakinto spindrift. The foam is blown in well-marked streaks along the direction of the wind. 9 47-54 41-47 Severe Gale High waves. Dense streaks of foam along the direction of the wind. Crests of waves begin to topple, tumble and roll over. Spray may affect visibility. 10 55-63 48-55 Storm Very high waves with long over-hanging crests. The resulting foam, in great patches, is blown in dense white streaks along the direction of the wind. On the whole the surface of the sea takes on a white appearance. The 'tumbling' of the sea becomes heavy and shock-like. Visibility affected. 11 64-72 56-63 Violent Storm Exceptionally high waves (small and medium-size ships might be for a time lost to view behind the waves). The sea is completely covered with long white patches of foam lying along the direction of the wind. Everywhere the edges of the wave crests are blown into froth. Visibility affected. 12 73-83 64-71 Hurricane The air is filled with foam and spray. Sea completely white with driving spray; visibility very seriously affected.